7.4 million crashes by 2022 could be prevented in the U.S. if 2019 models are equipped with V2X, according to researchers at University of Michigan Transportation Research Institute. DSRC-V2X is proven, road-tested, and used in cars today. Drivers are already behind the wheels of fully loaded cars, like GM’s Cadillac. Other carmakers in Europe, Japan and Korea, including Volkswagen and Toyota, are not far behind with plans to roll out V2X in upcoming model years. The questions now are not about tests and validation. Instead, it’s the roll-out of V2X on real roads to avoid accidents. How can you jumpstart your V2X development? Our new RoadLINK development kit based on the automotive-qualified one-chip SAF5400 V2X safety modem is made to do just that. Out of the box, you can connect your laptop to the V2X modem. It’s the same chip integrated with a high-performance security engine that you’d find inside the on-board units (OBUs) in production cars. The modem can support two antennas for dedicated short range communications (DSRC) based on the IEEE 802.11p standard – no cellular connectivity is needed! Run the provided demo code, and experiment with V2X from your office or home. If you like what you see, you can take your evaluation a step further and design real-time safety critical proof of concepts and feasibility tests for emergency road systems, platooning, and driver alerts to and from cars and the infrastructure – applications that only DSRC V2X can offer today. And if you need a jump start, a complete reference design is available for you to customize and add your own differentiating features. Speed up automotive-grade DSRC V2X development: New RoadLINK Dev Kit 2.0 is based on the SAF5400 single chip modem with SXF1800 secure element. Offers ready-to-design tools for global DSRC standards in Europe, North America, Japan and Korea. For optimal omni-directional safety messaging, most cars are designed with two antennas – one at the front of the car, and one at the back. As much as 6 meters of cabling to reach the OBU could be needed, resulting in attenuated signals. The development kit supports an antenna compensator that restores the signal level and compensates for the temperature dependent attenuation for transmission. Additionally, it amplifies received signals so that weak signals can be received and decoded correctly. Future proof with dual-channel support. The kit can also support concurrent dual channel communications for “day 2” applications that includes enhanced services and truck platooning. Integrated i.MX6UL to run stacks. 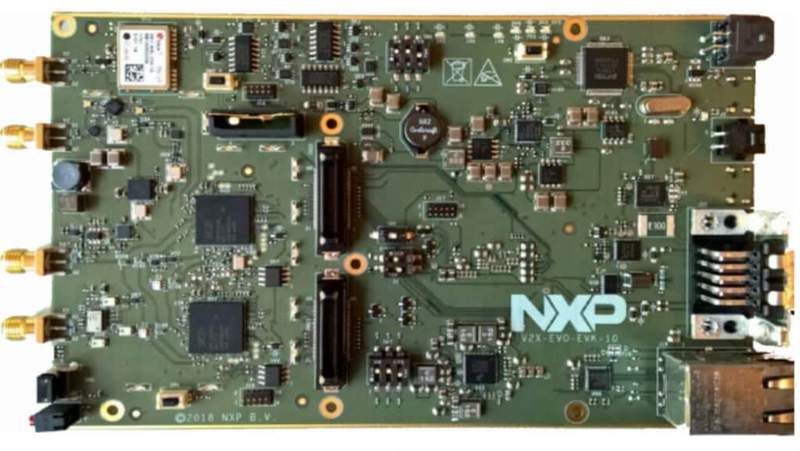 NXP’s i.MX6UL application processor is integrated on-board to run V2X software stacks and applications. A range of i.MX processors can be easily integrated depending on the performance levels needed for the V2X application. Customizable software stacks are available from leading V2X suppliers. Linux and QNX software development environments. It comes with host drivers to run Linux and can be used with other operating systems such as QNX, which is targeted to the automotive environment. Connectors make interfacing easy. Available interfaces include Ethernet, GPS, JTAG, and serial interfaces. The development kit can also connect to other MCUs and processors, including other processors from the i.MX family. And it’s incredibly flexible. For example, you can connect to an external processor via an Ethernet connection and build a complete ADAS or telematics system design that incorporates V2X. Securely verifies 2,000 messages per second. In a car-dense area, 100 or more cars could send and receive streams of safety-critical messages. If traffic is stalled around the corner — out of the line of sight from fast-approaching cars — for example, the V2X system must ensure that warnings to approaching vehicles are sent and received. The SAF5400 uses an on-board ECDSA hardware accelerator to verify 2,000 messages per second. The development kit also includes the SXF1800 Secure Element for a high level of secure storage of keys and certificates as well for signing outgoing messages. RF calibration tests for optimal performance. The kit allows RF calibration tests to quickly test sensitivity, output power and spectral mask [Class C] for optimal performance. Using the development kit, you can configure your system to detect dangers obscured by traffic, terrain, or weather and warn the driver to take action and avoid collisions. Connect to the infrastructure to keep pedestrians and work crews safe at crosswalks and road works. Set up emergency vehicle positioning and out-of-sight traffic congestion alerts. Build an interface to connect multiple trucks to configure a safer, driverless or driver-light platoon. The possibilities to enhance road safety with DSRC V2X are endless. Lowering the often-cited 1.3 million annual road fatalities is the automotive industry’s bullseye. With V2X in widespread use, together we’ll hit the mark.